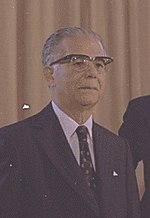 Joaquín Antonio Balaguer Ricardo (September 1, 1906 – July 14, 2002) was the President of the Dominican Republic. He served three non-consecutive terms for that office. His first term was from 1960 to 1962, for his second term from 1966 to 1978, and again for his third and final term from 1986 to 1996. In 2000, Balaguer decided to seek an eighth term as president he lost the election. On July 14, 2002, Balaguer died of heart failure at Santo Domingo's Abreu Clinic at the age of 95. ↑ "Joaquín Balaguer, 95, Dies; Dominated Dominican Life". New York Times.com. July 14, 2002. Retrieved December 5, 2013. This page was last changed on 22 April 2019, at 16:42.